Most people who travel to Lanzarote or Gran Canaria for their holidays are in search of the sun, the sea, sangria and whatever else a holiday in the Canary Islands may bring. A fair number will venture into the local church or cathedral as a sightseer or a worshipper. Few will choose to visit these islands on an ‘organ bash’. The liner-notes explain that there are dozens of organs in the Canary Islands. This is great news. Alas, most of them are unplayable. Bad news! However, there is a huge diversity of instruments to explore. Although part of the Kingdom of Spain, their geographical position allows for a wide range of influences which include Hispanic, Portuguese, German, British, French and Italian cultures. Michal Novenko points out that all of these nations had their impact on organ design, playing and repertoire in these islands. The present double CD explores organs built between the middle of the 17th century and the outbreak of the Great War in 1914. The geographer notes seven islands in the Canary archipelago, however only three of these support playable instruments – Gran Canaria, Tenerife and La Palma. Priory Records have chosen to give as wide a range of different organ types as possible. I have listed the organs, their dates and builders below for reference. I recommend exploring this double-CD a ‘church at a time’. Armed with the organ specifications provided in the liner-notes the listener will be able to contrast and compare the wide variety of timbres, pipe voicings, registrations and tonal schemes these organs present and will enjoy the eclectic musical offerings. It is not necessary to discuss all 42 tracks; however it is of interest to note that the selection covers a wide period of musical activity. Many of the pieces are Spanish and Portuguese from the sixteenth and seventeenth centuries. I was especially taken by the dramatic ‘Discurso de 1° tom’ which opens the proceedings. This is believed to have been composed by a nun. The three pieces by the Catalan composer Antonio Mestres were enjoyable as were the more diverse works by Joan B. Cabanilles one-time cathedral organist at Valencia. Music by German composers is included. The Canarie by Michael Praetorius is a variation on a local folk tune which showcases the fine Richborn organ. The Canzonetta by Dietrich Buxtehude is pure fun. French music is represented by Léon Boëllmann: the ‘Sortie’ and the ‘Andantino’ from the Heures mystiques. These straightforward pieces sound particularly effective on the Bate organ. It is good that a number of works by English and American composers have been selected. I enjoyed Jonathan Battishill’s delightful Air and Charles Burney’s Fugue in F minor played on the organ of Santa Cruz in Tenerife. The charming Air and Gavotte by Samuel Wesley is heard on the organ at La Laguna. I had not come across the music of Charles Elbridge Whiting before. However, this 19th century American composer and professor of music was active both sides of the Atlantic. His Chorale Prelude may be a little four-square, at least on the Bevington organ, however his Andante tranquillo is quixotic and sweet. Three organists have contributed to the success of this project. 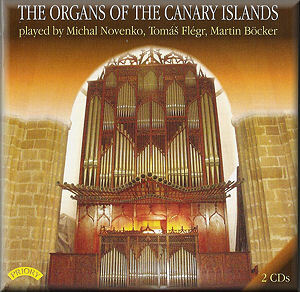 Firstly, the Czech-born Michal Novenko, who has featured in other Priory organ bashes in the Balearics and Malta, plays a large number of these tracks. The second is Martin Böcker from the Ruhr in Germany who is an organist, harpsichordist and teacher specialising in master-classes and organ excursions. Finally, Tomáš Flégr is an active recitalist, who has spent time as organist at the Templo ecumenico on Gran Canaria. He is also a keen carillon player. All the playing on these two CDs is excellent. The quality of the sound is superb. It is a testament to the sound engineer (uncredited) who has done such a sterling job in balancing the huge variety of acoustic and tonal idiosyncrasies. The liner-notes are typically excellent and naturally include all the organ specifications. The downside is that the dates of most of the pieces of music are not cited and there appears to be confusion in the track-listings as to which pieces are by what composers. Additionally the church names do not quite tie up with the organ specs. For example, is the final piece played at Orotava, Parroquia de la Concepción or Nuestra Señora de la Concepción? This confusion appears to have carried over into the listings on the Amazon site and other CD retailers. I hope I have got it right in my review! However, these are relatively small points in such an excellent and important project. This CD will be of huge interest to all organ music enthusiasts and will undoubtedly bring a little warmth and sunshine into the lives of people living in colder and greyer climes. It is an impressive achievement from every perspective. I am looking forward to many more explorations in this series. What about the Azores, Gibraltar and perhaps, nearer to blighty, the Islands of the UK?